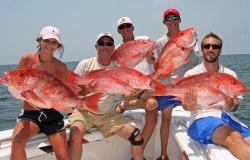 What Is Regional Red Snapper Control In the Gulf States? “We’re optimistic going into the new year that we will have a legislative solution in the first half of the year, in time enough to save our red snapper season for next summer,” Congressman Byrne said. “What we did, in committee, is we amended the reauthorization of the Magnuson-Stevens Act, the law that governs the fisheries of the United States. Congressman Byrne said he and many others he has spoken to believe the data collected by the Gulf States Marine Fisheries Commission (GSMFC) would be much more reliable than the data currently used by NOAA. The data from Blankenship that Congressman Byrne referred to came from the Red Snapper Reporting System, which was implemented by Alabama Marine Resources for the 2014 season. NOAA estimated the catch off Alabama during the nine-day federal season at slightly more than 1 million pounds. 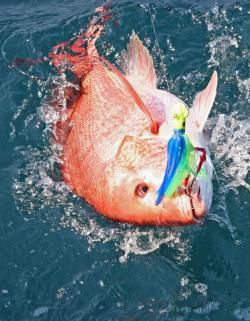 The data collected through the mandatory Red Snapper Reporting System indicated Alabama anglers landed 418,000 pounds of red snapper. Congressman Byrne invited fellow Congressman Steve Scalise (R-Louisiana) on a red snapper fishing trip this past summer to give the new House Whip an idea of how outstanding the fishing is off the Alabama Gulf Coast. “That was a great opportunity for Congressman Scalise to go out and see just how plentiful the stock is,” Congressman Byrne said. “That’s important because I will be on the Natural Resources Committee next year, so I can drive it through committee. But getting it up on the House floor for a vote is another thing. To have the Whip as an ardent advocate for it really does help. That’s one of the reasons I’m optimistic. Blankenship was invited by Congressman Byrne to testify before the House’s Natural Resources Committee recently in Washington. During those committee hearings, Congressman Byrne grilled Samuel Rauch from the National Marine Fisheries Service (NMFS) about the enormous NMFS budget of almost $900 million and how that expenditure failed to produce reliable fisheries data. “The three things I stressed in my testimony started with what a great red snapper fishery we have off Alabama because of all the work we’ve done over several decades to build artificial reefs,” Blankenship said. 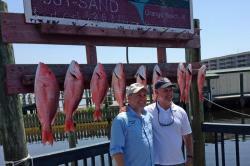 “That laid the foundation on why that fishery is so economically important to our state. “The second thing is we had to implement our own Red Snapper Reporting System because the information gathered by the federal government through its program we felt was incorrect. The obviously defensive Rauch said that some of the artificial-reef data has been used in the last stock assessment, although he admitted it was not a large factor. Blankenship said that is exactly the problem. “What NOAA did was down-weighted our information because, in their opinion, it wasn’t as valuable as the data they collected,” Blankenship said. “They didn’t use our information at the same level or with the same importance in the model. So we’re really striving in the next red snapper stock assessment that our work will be used the way it should be in the model. Blankenship said he fielded several questions during the hearing and meetings with congressmen after the hearings on how Alabama could manage the fishery. A regional management plan is still working through the Gulf Council process as well. The next Gulf Council meeting is scheduled for Jan. 26-30, 2015, at the Grand Hotel in Point Clear, Ala.
Blankenship said he’s not sure snapper fishermen will see relief in 2015, but he does think 2016 holds a great deal of promise. “If they start using our red snapper data and get an update on the stock assessment, I hope to see the season back up to between 30 and 60 days in 2016,” Blankenship said. “The stock is required to be rebuilt by 2032, and we’re meeting those goals much quicker than that. PHOTOS: (ADCNR) Rep. Bradley Byrne, right, of Alabama’s First District and Rep. Steve Scalise from Louisiana show off the red snapper catch after a trip out of Orange Beach this past summer. The Congressmen are working on legislation that would give the Gulf states regional control of the red snapper fishery and extend the boundary for state waters of each of the Gulf states to 9 miles. This entry was posted in Conservation, Saltwater Fishing on December 31, 2014 by ronniegarrison. Its hard to believe this is the last few days of 2014. Every new year gives hope of better things for us, and if we work at it, each new year will offer them. The end of the year is a time to reflect but also to plan, and to make resolutions to better yourself for the future. Reflecting back, not over just the past year but over all the past years, I realize I have been blessed with a wonderful life. I had two parents that loved me but did not smother me. When I read about “helicopter parents,” parents that hover around their children all the time even to the extent of moving to the town where they go to college, I grimace. My parents took care of me but allowed me to be free. I spent countless hours out in the woods and on ponds by myself or with friends my age. That taught me independence and to think for myself, something I fear kids now days will never have the change to learn. I was taught to work for what I wanted, and to keep my wants reasonable. Never in my life would I bite off more than I could chew, as my dad used to say. I can’t imagine using a credit card without paying off the balance every month nor can I imagine depending on others to support my wants. That is something else I am afraid the current generation will never learn. I know I am the only one responsible for my decisions and the mistakes I make. I call my mistakes “self inflicted wounds” and know to not blame others for them. Anyone can succeed and become almost anything they want to be, as long as they work at it and don’t blame others for their problems. I often shake my head in amazement when hunters and fishermen blame their “bad luck” on others, or things they can’t control. The wind changed direction and the fish quit biting? Change your pattern, don’t cuss the wind. Someone is sitting on the point you wanted to fish? Go to a better one. For the new year I plan on living by the things I have learned and that I know will work. I love bass fishing and am determined to think while fishing a tournament, not just go through the motions. If my favorite way of fishing isn’t working I will do something else. If deer just won’t come by my most comfortable stand I will go to one that is not as comfortable and change my luck. I won’t blame bad luck when I turn my head too fast and spook a deer, I will just move more slowly when scanning the woods. And I won’t climb out of my stand as soon as my feet get cold or I get uncomfortable. I will stay as long as possible to improve my odds. This next year I hope adults will take the time to work with kids and teach them to hunt and fish. One common character of the students that got into trouble and were sent to my school when I was principal of the alternative school was they did not have parents or other adults that took time with them. I will never forget the way the kids eyes lit up and how excited they got when one of my teachers organized a scout troop and took them fishing. I hope every kid will have an adult that will light up their eyes. And it seems that kids spending time outdoors somehow insulates them against the things that get so many of them into trouble. There is an old saying that God doesn’t count against you the time you spend fishing. I hope so, and I am determined to go fishing every time I can, and to enjoy every trip. Even if I make mistakes and don’t do well in a tournament I will try to enjoy the time fishing and learning from my mistakes. This coming year the counselor and two teachers, with the help of some students at Spalding High are trying to organize a bass fishing club. I will do everything I can to help this club be successful, and encourage members of my two bass clubs to work with them, mentor them and take them fishing. We live in a fantastic country with unlimited opportunities for anyone willing to take advantage of them. Too many folks scoff at that idea for some reason, but it is true. Nowhere else on earth can anyone achieve their goals like they can here. I hope parents will be parents, and teach their children to work for what they want and to not blame others for their problems, just like my parents taught me so many years go. The possibilities are unlimited. This entry was posted in Fishing Ramblings - My Fishing Blog, Fishing With Family and Friends on December 30, 2014 by ronniegarrison. I like to make New Year’s resolutions that are more like wishes since I really don‘t follow them like I should. The beginning of a new year is always a good time to think about what we want to do better in the coming year and how we can improve ourselves. When making wishes about the outdoors it can be a lot of fun, too. For everyone else my wishes don’t require much work. They are just things I hope people do and have fun, and maybe think about a little. If you like these New Year’s wishes adopt them. If not, make your own and enjoy the next year. For all fishermen I hope you catch the biggest fish of your life and thrill to the excitement of landing it and sharing your catch with friends. I hope you go fishing one day and land so many fish you can brag about it without exaggerating. But I also hope you go fishing one day and don’t get a bite, and realize at the end of the day that you still had a great day and there is nothing you would rather do. For hunters I hope the deer have huge racks, the birds fly into your shot pattern, the turkey fall in love with your calls and the squirrels move around to your side of the tree when you throw a stick to the other side. I hope every time you kill an animal you stop for a minute and regret that it had to die to fulfill the hunting tradition. May you always clean and eat all of your kill, enjoy the bounties of the outdoors, and realize it is part of the natural world. For bass fishermen may you release almost all the fish you catch, especially the big ones, but may you also take a few home to cook without any bad feelings. Realize fish populations are a renewable resource and you can keep some without hurting the future. May every child have an adult that will take time to show them how to safely load and carry a gun, and how to be careful every second they are using one. And may that person take them squirrel hunting and let them experience the excitement of stalking a bushytail while it scampers around feeding on acorns. Maybe that training will pay off when it comes to big game at some point, too. I hope every adult has a kid they can share a day with and let their excitement and exuberance remind you of how it feels. Maybe sharing that feeling with them will re-kindle some of those feelings that have seemed to fade in you over time. And sharing the day will make memories for both of you that will last from now on. This year I hope you enjoy all the toys that can make being outdoors more fun. 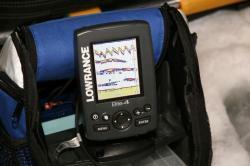 Fish out of a big fast bass boat and use a GPS to find a honey hole. Use the most modern rods and reels spooled with high-tech line and throw a $25 lure to catch a bass. But also sit on the dock on a pond with a cane pole and a can of worms and watch a cork float in the ripples, waiting on it to quiver and go under. Don’t go hunting and concentrate so hard on killing a trophy buck you miss the cardinal that lands in a nearby dogwood to eat berries. Watch a squirrel and try to figure out why we call them gray squirrels and they look gray but don’t have a single gray hair on their bodies. And look up when you hear the distant trilling and think about the huge distances migratory birds travel when a flock of sand hill cranes fly over. Spend some time flying down a big reservior at 70 miles per hour heading to honey hole full of bass but also spend some time easing along a small creek, dabbling a hand tied fly in the pools for bream and small bass. Enjoy the beauty of every fish you catch, noting the bright colors of a spawning bluegill and the intricate patterns on spotted bass. Take time to smell the outdoors and note how it changes with the weather and places you visit. Catch a whiff of wood smoke on a freezing cold morning while out on a lake and feel warm just from the smell. Listen to the sounds of nature and note how fog mutes them and seems to make the whole world hush. If I could make these wishes for all who enjoy the outdoors I would try to make sure they were good ones. But most of all, I hope and wish everyone gets to spend time fishing and hunting and enjoying nature. This entry was posted in Fishing Ramblings - My Fishing Blog on December 28, 2014 by ronniegarrison. As of July, 2009 its official – we have a new world record bass. A 22 pound, 4.95 ounce bass caught in Japan last July was certified this past Friday by the International Game Fish Association (IGFA) as a tie for the world record. Way back in 1932 a Georgia boy fishing in a small oxbow lake off the Ocmulgee River landed a huge bass. He took it to the post office in Helena, Georgia and weighted it, then entered it in the Field and Stream big fish contest. That fish weighing 22 pounds, 4 ounces held the world record status for 77 years. The reason the new bass is considered a tie is the IGFA requires a new record to beat the old record by at two ounces. There are several reasons for this, including the fact that new scales are more accurate then older scales. Also, a spring loaded scale will usually show only pounds and ounces, not pounds and tenths and hundredths of ounces, that the new ones show. When George Perry landed the big bass in south Georgia, bass fishing was a simple sport and was more for food than sport. Rods and reels were primitive by today’s standards, as were line, hooks and lures. And bass fishermen could not even dream of depth finders, you stuck your rod tip into the water to see how deep it was. Even when I started bass fishing in the 1950s, 25 years after Perry landed his fish, most of our time was spent in a wooden rowboat sculling with a paddle to move around. We fished with a knuckle busting casting reel that had no free spool or level wind, or one of the new fangled spinning reels. Line was a form of braid since monofilament line was just hitting the markets. Manabu Kurita, the young Japanese fisherman that now holds the record, was using some of the best rods and reels available and casting a swim bait on high tech line. The swim bait is a very new type bait that has been on the market just a few years. It took the IGFA months to review the application and make sure all rules were met. They even required the fisherman to take a lie detector test to verify he caught the fish legally and was not fishing in an off limits area as some gossip claimed. And the scales were carefully tested to make sure they were accurate. The reason for all the care in certifying the record is the fact it will probably be worth millions of dollars to the fisherman. All that endorsement money has caused many false claims of world record bass, none of which have been verified. A few years ago a bass weighing 25 pounds was caught in California and pictures were taken of it. But the fish was released and no application was made for the record because the fisherman snagged the bass in the side. While trying to get it to hit while on the bed he hooked it in the side and the rules of the IGFA require the fish be caught in a sporting manner. Is there a bigger bass out there? Maybe. And this record may be beat at any time. But it may stand up for 75 more years, just like Perry’s record. This entry was posted in Bass Fishing on December 26, 2014 by ronniegarrison. Would You Want To Go Fishing Every Day Of the Year? I grew up in Dearing, Georgia, a wide spot on Highway 78 in McDuffie County, Georgia between Thomson and Augusta. Our claim to fame was a caution light at the crossroads at Iron Hill Road. My house was on a small farm a quarter of a mile from that caution light. Town consisted of six small stores that included a gas station, a tiny grocery store and four stores where you could buy anything you needed, from gas and kerosene to frozen food and bullets. They were true country stores and many shopped in them for clothes, fishing supplies, canned food and cigarettes. Hoop cheese was one of my favorites and you could get any size slab you wanted. The proprietors of two of those stores also drove school buses. They would run their routes in the morning then open the store. When time to run their afternoon route their wives kept the stores open while they were gone. I rode Mr. John Harry’s bus from kindergarten through my senior year in high school. One year Mr. John Harry and Mr. Joe Frank made a pact they were going fishing ever single day the next year. And they did. They would fish every weekend but also kept a rod and reel on their bus and often stop at a farm pond or creek crossing on the way home in the morning or afternoon for a little fishing. This New Year’s Resolution sounded like a perfect one for me and one I wanted to make each year since then. When I retired in 2001 I tried but never was able to fish ever day. Something always messed me up, like surgery on my thumb or a trip on a cruise ship, where there is water, water everywhere but no way to fish! For several years my efforts ranged from missing seven to 25 days. That is not bad out of 365 days in a year, but not perfect. Then in 2009, I fished some every single day of the year! I finally did it. My rules were fairly simple. I don’t have to catch a fish every day, but I have to fish somewhere that I could catch a fish. So no fishing in the bathtub or in a rain filled ditch. And there is no time limit. Some days I stand on one foot in my bass boat for ten hours casting for bass, others days I sat in a folding chair on my dock for ten minutes catching bluegill on pellet fish food. Some days tried my determination to fish every day. On a week long trip to St. Louis to attend an outdoor writers meeting, I stayed at a hotel. There was a small creek with a pond on it on the hotel property but I was told no fishing was allowed. I let everyone know how stupid it was to have an outdoor writers meeting at a place that didn’t allow fishing, but their rule made me explore the Bush Wildlife Area just outside town, a beautiful place open to the public that included over 20 ponds that I could fish. The Budweiser beer people made this place available to the public and is a fantastic resource for people in the area. I found out the third day of the conference no one watched the pond for fishermen so I did wet a line there, too. I saw some small fish around the edges but didn’t catch anything. Another tough day was when I had a doctor appointment in Mobile, Alabama and had to leave early in the morning for it. I drove out to my place at daylight and fished for a few minutes before leaving. I was determined not to let anything mess up my record that year. I fished when it was so cold I had to dip my rod tip in the water to melt ice from the guides to days sweat dripped from my nose and ran into my eyes constantly. And I fished in Georgia, Alabama, South Carolina, Wisconsin and Missouri and caught largemouth, smallmouth and spotted bass as well as crappie, bluegill, green sunfish, shell cracker, bullheads, flathead catfish, hybrids, stripers, rock bass, gar, carp, bowfin, walleye, muskie and northern pike. I kept logs on my old web site forum listing each day fishing and what I caught. It is a good way for me to keep up. It was been a fun year. I actually fished every day between November 2, 2008 and the end of the year. That was 424 days in a row. Maybe I will get tired of fishing some day, but not yet! Gotta go fishing – Day 3 of 2010! This entry was posted in Fishing Ramblings - My Fishing Blog on December 25, 2014 by ronniegarrison. Can I Catch Fish At Night While Ice Fishing? When ice fans dream of upcoming escapades, many optimistically envision epic getaways spanning a weekend or more. Unfortunately, extended adventures can be tough to pull off, given the time constraints of daily life. Indeed, just carving out a full day on the ice can at times be a challenge. 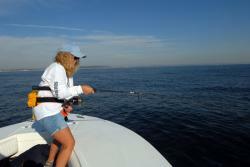 Good news is, opportunities abound for enjoying quick trips offering great fishing for a variety of species. And some of the finest occur shortly after darkness falls. Pre-trip scouting and packing allows you to zip out to evening hotspots on a moment’s notice. Typically, Glorvigen’s bug-out gear includes a small tackle bag stoked with a handful of key lures, components and tools; a minnow bucket for transporting either shiners for walleyes or small fatheads for crappies; two headlamps; an auger; and Lowrance sonar and GPS electronics. A lantern is also critical equipment. “I’ve used gas and propane models for years, but last winter I started using Zippo’s battery-powered, LED Rugged Lantern and really like not having to worry about fuel or kicking the light over and burning down the house,” he says. Jigging rods are typically strung with 6-pound-test Northland Bionic Braid, with a foot-long, 6- to 8-pound monofilament leader, capped with a round-nosed snap. Bobber rods sport 6-pound mono mainline, a small swivel, and an 18-inch leader of similar material as the jigging setup. A size 4 single hook-either standard bronze or phosphorescent glow-and small split shot pinched six inches above it round out the rig. Glorvigen favors 1/16- to 1/8-ounce Northland Buck-Shot Rattle Spoons, in phosphorescent shades of red and orange. “If it’s glow, it’s a go,” he quips. Spoons are tipped with a minnow head or tail. “Try them both to see what the fish want on a particular night,” he adds. Crappies call for a bit lighter rods and line in the 2- to 4-pound class. Lures lean toward the horizontal orientation, and include favorites like the Northland Bro’s Mud Bug and Gill Getter. “I typically fish glow colors exclusively at night, including phosphorescent blue, red and white,” he says. Spikes and waxworms are top tippings. “You can fish glow plastics, but after dark I like the scent of live bait.” As with his walleye endeavors, two of Glorvigen’s four rods are rigged for live bait duties. Often, that entails deadsticking a small jig sweetened with a maggot. Glorvigen houses his gear in a Frabill SideStep flip-over, which sports dual side entries perfect for two-person nighttime expeditions. “If one angler wants to head outside to check out a few different holes, he or she won’t have to flip up the entire shelter and stumble over gear on their way out.” He notes that a pair of Frabill light bars positioned strategically over the fore and aft sections of the shelter provide ample illumination for fish wrangling, knot tying and other nocturnal tasks. Early evening is prime time for both walleyes and crappies. For both species, active jigging attracts attention and triggers its fair share of strikes, while live bait seals the deal with curious ‘eyes that look but don’t bite. Overall, jigging cadences are tailored to the mood of the fish, but Glorvigen generally avoids over-the-top antics that may work in daylight but fizzle after sunset. “Night-bite walleyes are focused on baitfish that are hunkered down for the evening, so they respond better to subtle jig strokes than aggressive lifts and snap-fall sequences,” he explains. To further boost his odds of success, Glorvigen pinpoints potential hotspots by day, and plots their locations for easy return at night. “Do your homework ahead of time so you’re not hunting for fish after dark,” he says. “For walleyes, look for small shelves and stairsteps along breaklines fish follow from deep water up onto shallow feeding flats. High spots on humps can be good, too. Steady jigging just above a pod of crappies tempts fish to rise for the kill. Glorvigen notes that walleye action often peaks during the two-hour period surrounding sunset. “With crappies, the bite window is less intense but more spread out, and can continue later into the night,” he adds. Along with offering a fine chance to ice numbers of eating-size ‘eyes and crappies, Glorvigen says early evening is a great time to connect with the walleye of your dreams. “Finding the right spot and hunkering down for a couple hours during prime time puts you in great position to hook a giant,” he says, providing yet another reason to enjoy happy hour on the ice as often as possible this winter. Check out more of Scott’s night-bite tips. This entry was posted in How To Fish, Ice Fishing on December 24, 2014 by ronniegarrison. What Is Your Best Outdoor Christmas Gift Ever? What is the best Christmas gift you ever received? Mine all seem to deal with the outdoors, from fishing and hunting supplies to camping gear. Getting up on Christmas morning and discovering what Santa had left me was always thrilling. And there were always presents from my parents, too. When I was 15 my parents gave me and my brother Mitchell 300 spinning reels and matching Abu Garcia rods. I used my outfit for many years, catching anything that swam in ponds and lakes around my house, including bream, catfish, bass and crappie. I still have that old Mitchell in my garage. Long past its usable days, I keep it to remind me of those great times. There was always a variety of hooks, sinkers and corks in my stocking, and they were real corks, the kind you had to split with a knife so you could put it on your line. Fortunately I got a knife pretty much every Christmas, too. I used my pocket knifes for everything from splitting corks to cleaning squirrels, and we played games like mumbly peg with them, too. After Crème came out with “rubber” worms I got a pack of every color they made. Red or black worms were your choices back then. And there was usually a Hula Popper, Snagless Sally or Creek Chub lure to cast for bass. I wore them all out. I got a BB gun when I was six after having my tonsils taken out and every Christmas after that for several years I got several tubes of BBs under the tree. When I graduated to a .22 rifle and a .410 shotgun I always got a brick of .22 bullets and some shells. Those ten boxes of 50 bullets in a carton meant many hours of shooting squirrels, birds and targets. But they didn’t last all year so I had to go up to Mr. John Harry’s store fairly often and buy them one box at a time, for 50 cents! And I got a couple of boxes of .410 shells to shoot rabbits and shoot at birds. I could always hit rabbits much better than doves and quail with that single shot gun. Clothes were always under the tree but I didn’t pay much attention to the school clothes. But my eyes lit up when I got a camo jacket, a set of Duckback briar proof pants and coat or boot sox. I knew I would be doing things I loved when wearing then, as opposed to when the school clothes were worn. Things were more simple back then. There were lots of fun things from cap pistols and rolls of caps to boxes of sparklers. And fruit was included in the stockings. Bananas, apples and oranges as well as pecans were always there. Strangely enough, the oranges looked exactly like the naval oranges in the big bag we had brought back from our annul Christmas visit to my grandmother in Ocala, Florida. And the pecans looked just like the ones we had been picking up in the yard that fall. Each year there was one big gift, too. One year I got a shooting range thing that had ducks that revolved on a pole and I shot at them with a gun and rubber stopper bullets. And I will never forget the bicycle I got one Christmas. It still makes my heart ache when I think about it. Daddy was the Ag teacher at the local school. One afternoon just before the holidays I went out to the shop. There were two bicycles hanging there. Daddy had bought two old bikes, repaired them, sanded them and painted them. I knew immediately they were for me and my brother for Christmas. When I got my bicycle I was disappointed it was not a new one and I was a little embarrassed about it. But I rode that bicycle everywhere, going squirrel hunting with my .22 on the handlebars or fishing with my tackle box in the basket and my rod and reel across the handlebars. It was few year later, when I was a little older and wiser, that it hit me that daddy could not afford a new bicycle for me and my brother. So he found something he could afford and worked many hours to make them look brand new. I realized how much love and care went into those bicycles and I am ashamed of my self, even after over 50 years, of how I felt when I first got it. Decorating the house was always fun, too. And we used home-made ornaments mostly, from stars made with left over foil to toothpicks stuck into sweet gum balls and painted. There was the annual trip to the old house site overgrown with what mama called Smilax, what I know now as green briar. It stayed green all winter and we outlined the door with it and put a red home-made bow on the door. My job was to find the tree, so all fall when hunting rabbits and quail I watched for the perfect cedar growing in old abandoned fields. There were always hundreds of them and it took a lot of effort to find the perfect one. When I did we would go to it the week before CHristms in our old truck and cut it down. I still love the smell of cedar in the house this time of year. I think Christmas has changed too much in my lifetime. I hope you will still share some of the old ways this year. This entry was posted in Fishing Ramblings - My Fishing Blog on December 23, 2014 by ronniegarrison. What Are Some Kayak Fishing Basics? Thinking of buying yourself a ‘yak for Christmas? Here are some of the points you might consider. Cost: If you’ve been thinking of taking the plunge with a kayak, there’s never been a better time. Kayaks have become very popular in recent years, meaning that more manufacturers are making them and prices for an entry-level kayak are even lower than they used to be. Standard kayak models start at a low of about $200 on sale, but you’ll want to spend more for a fishing kayak that comes complete with rod holders and other angling amenities-expect to pay from $250 on up on sale. You’ll also be buying a double-bladed kayak paddle, which will run you $50-100 or more. Most kayaks don’t include a padded seat, and you’ll probably want one; add another $50-75. Yes, the tab is adding up pretty quickly, but you’re still well under what the cheapest johnboat and trolling motor will cost you. Smaller accessories, such as a light anchor and-of course!-a life vest, you may own if you’re already a boater. Fishing kayaks: The simplest thing that defines a “fishing kayak” is the presence of rod holders. A fishing kayak will also usually be wider than standard kayaks-around 30″ or so-and therefore more stable. It may have extra storage features, like molded in tackle trays or even a baitwell. Note that you can add after-market rod holders to most kayaks, but you’re better off starting with a fishing kayak, mainly for the added stability. A wider kayak won’t cut through the water as quickly as a standard model, but you’ll be able to cast, set the hook, and land frisky fish without feeling like you’re about to take a spill at any moment. I was really surprised at how stable my kayak is-definitely less tippy than most canoes I’ve used. Length: Length is important. A longer kayak will travel faster and more efficiently (and have more storage space), but weigh more to load and carry-especially important if you’re cartopping or portaging. 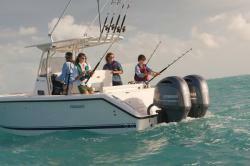 Twelve to thirteen feet is a popular range for saltwater anglers, and will provide a roomy and stable freshwater fishing platform too. However, if portability is important, look hard at kayaks ten feet or less in length. My ten-footer is a lightweight at exactly fifty pounds, but I’d still swear it’s half full of water when I hoist it back onto my roof racks at the end of a long paddling day. The weight is much easier to handle if you’re securing your craft to something below shoulder level, like a pickup bed or trailer. A kayak cart can also be a big help moving your boat from car to water (more on that later). Long story short, consider weight an important factor based on how you’re transporting your kayak. One of the (few) annoying things about fishing from a lightweight kayak is that it is easily pushed around by wind or waves, so you’ll want a lightweight folding anchor to help you stay put. An anchor works best in deeper water or when you’ll be staying put for a little while, such as when fishing bait. If you use the anchor a lot, you’ll want an anchor trolley that allows you to position the anchor line fore or aft, depending on wind or current and how you want to position your craft. For frequent moving and anchoring-which I’ve found to be the norm for lure fishing-a stakeout pole is much more convenient. This is simply a pole pushed into the lake bottom to anchor the kayak. The pole can be inserted through a scupper hole, or attached to the kayak with a short rope and snap clip. Many anglers prefer a stakeout pole over an anchor, because there’s less chance of tangling with a scrappy fish. You can buy a commercial stakeout pole, or make your own out of PVC pipe or any other sturdy pole such as an old golf club with the head removed. Use is obviously limited to fairly shallow water, depending on the length of the stakeout pole. Fishing from a kayak: Okay-you already know how to fish. But fishing from a kayak is different, even from fishing in a small canoe or johnboat. While fishing kayaks are usually very stable, you must keep your balance in mind at all times-when leaning over to unhook a snagged lure, setting the hook or netting a fish. While fishing kayaks are roomier than their standard-sized brethren, space is still at a premium. Many of your kayak customizations, if you make any, will probably involve gear storage. I don’t like much in my way while kayak fishing, and keep minimal gear (like hooks, plastic worms, and pliers) in a small tackle box or tackle bag in front of me. The rest of my tackle, plus raingear, sunblock, etc. are in a larger waterproof duffle bag stowed behind my seat. I don’t need to move to release a fish, tie on a new hook, or change out my worm. If I need something more, I can reach back to grab the duffel bag, or hop out in shallow water to grab it. Water or sports drinks-a must for the Florida kayaker-go under the bungee straps in the front or rear of my kayak, depending on the rest of my loadout and available space. My kayak actually has a cup holder right in front of the seat, and a sports drink goes there right away when I launch. The kayak advantage: Besides simply being fun and exciting to fish from, kayaks have one more major advantage: portability. Anywhere you can stand, you can launch. Since getting my kayak, I’ve been amazed at the world of new fishing opportunities that have opened up for me. Some of these new opportunities have turned up at my “old” fishing holes, where I can now launch a boat off a 60-degree canal bank, or where a sliver of public shoreline lets me get into an otherwise-inaccessible lake. I recently fished a narrow canal that would have been too brushy even for a canoe. There’s something eminently satisfying about catching a big fish that you know was out of reach of anyone else-except a fellow kayaker. This entry was posted in boats and boating, How To on December 22, 2014 by ronniegarrison.